Primary education in India suffers from many problems, including a lack of teachers, disengaged students, irrelevant textbook content and chaotic classrooms incorporating multiple grade students under one or two instructors. Although the government has invested heavily in universal primary education, in less developed areas school dropout rates remain as high as 40%, and 70% of students in Class 1 fail to reach Class 5. Overburdened teachers have little creative control of classroom content and teaching methodologies. Left with little external support, teacher absenteeism can be as high as 50%. Collectively, this is leading to dire educational outcomes for students in rural India. Founded by the husband and wife team of Padmanabha and Rama Rao, RIVER’s key innovation is School-in-a-Box, an activity-based learning program, where government curricula are adapted for local context and organized into smaller modules that align with each student’s ability. Children from different levels learn together in a self-directed fashion, enabling teachers to spend more time with weaker students. Local teachers gain ownership over their learning materials by developing School-in-a-Box sets, consisting of cards, charts and songs customized for their students. RIVER’s School-in-a-Box learning materials are cheaper and more durable than textbooks, and its work has already created a critical mass of 500.000 teachers who are replicating the model in 200.000 schools in 15 languages. 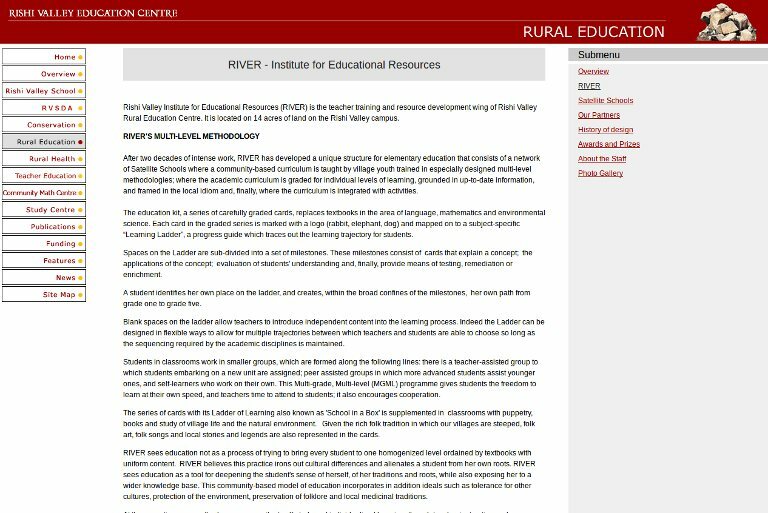 RIVER gives teachers extensive support through training, information exchanges and distance learning tools in their network. It also engages parents and local communities in the education accountability chain, creating feedback loops for quality control wherever its model is replicated. The organization is financed largely by state and national governments. Key players in public education including education secretaries, district administrators, principals and teachers, are trained in RIVER methodologies for two to four weeks at the Rishi Valley Institute. RIVER then closely mentors the teams over a period of two years to ensure proper implementation of the model. As a result of implementing the RIVER methods, attendance in their schools is above 80%, dropout rates are 30% lower, and students’ learning levels are 40% higher than those of public schools. UNESCO reports confirm the improved math and verbal scores of RIVER students and the enthusiastic learning environment generated by the program. In the next years, they hope to reach 20 million children.